Special Containment Procedures: SCP-3076 is to be contained in a dedicated aviary at Site-104. It is to be fed twice daily, and provided new forms of simple entertainment monthly. Visual contact with SCP-3076 is to be limited to an absolute minimum. Outside of testing, no personnel are allowed entry to the containment chamber. Test subjects must be confined to a cell or containment chamber to prevent the possible spread of infection. It is recommended that test subjects in the tertiary stage of SCP-3076-A be terminated, and all related materials destroyed. Any contact between SCP-3076 and computer systems is strictly prohibited. 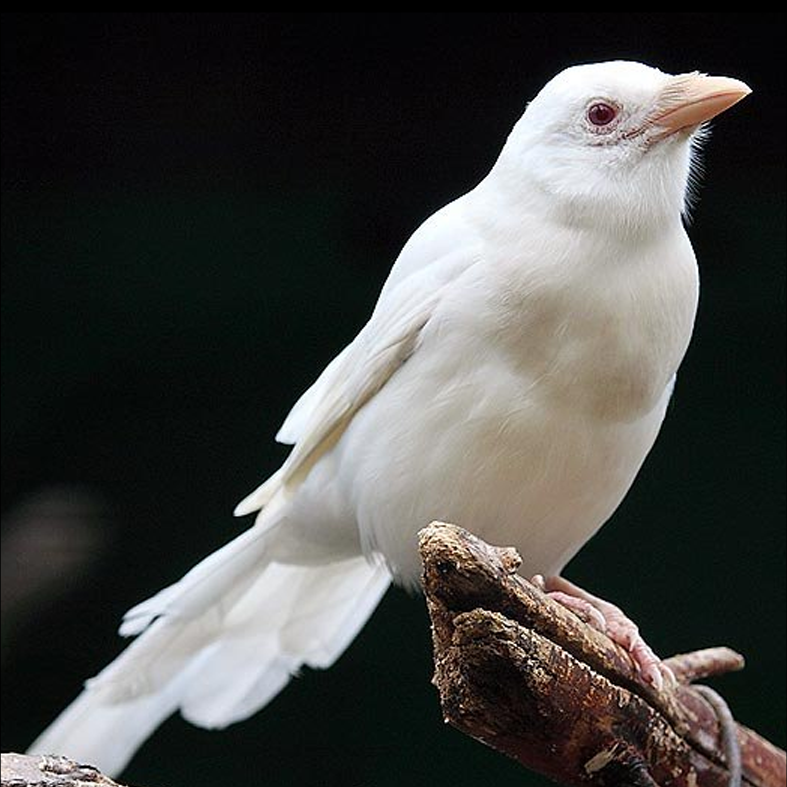 Description: SCP-3076 is an albino black-billed magpie (Pica hudsonia).1 It is abnormally intelligent, expressing an understanding of written language, though it is unable to understand most verbal communication. It is estimated that SCP-3076 has the mental capacity of a ten-year-old human being. SCP-3076 is capable of deceptive behavior, such as feigning illness or ignorance, and possesses extremely long-term recall. SCP-3076 may use these skills in attempts to escape containment unless properly cared for. When directly viewing SCP-3076, all sapient beings analytical systems will feel a compulsion to produce some type of artistic expression. This is the first stage of the SCP-3076 cognitive infection (SCP-3076-A). Those with a preexisting disposition toward one form or medium will feel compelled to more strongly pursue these prior tendencies. Those with no previous experience with artistic expression appear to select a random art form to pursue. SCP-3076 is only able to produce this effect after several aggregated hours of viewing, though the precise number varies from subject to subject. It is also possible to transfer the effect through other sensory means, especially if the subject is blind, though the time required for infection to occur is much higher. Note that this stage of the infection is reversible if contact between SCP-3076 and the subject is terminated. To date, no subjects have expressed satisfaction with their work, and will continue to produce art in an attempt to improve. After approximately two weeks, SCP-3076-A enters its secondary stage, and no action short of induced coma will reverse the effects. Subjects in this stage of infection will improve at a normal rate, considering heightened resolve and enthusiasm. Over time, subjects will continue to devote more and more time to the pursuit of their art form. Without outside intervention, about 80% of subjects expire due to thirst or starvation, as most affected individuals forego basic needs in the pursuit of their art form. The SCP-3076-A enters its tertiary stage approximately 13 months after initial exposure. Subjects will begin to produce anomalous artwork, most commonly bearing cognitohazardous material. It is unconfirmed whether the SCP-3076-A is able to spread via these works. SCP-3076 was found after Incident 3066-5, in the forests of Linville Gorge, North Carolina. It was initially collected by Foundation operatives as a part of the reconstruction operation after Incident 3066-5, and its anomalous properties discovered after many of the personnel involved with its recovery began to neglect their professional duties. Upon confirmation of its anomalous properties, SCP-3076 was moved to Site-104 for containment and further study. The following is an incomplete log of SCP-3076 testing to highlight noteworthy findings. Description: D-461923 was made to spend 2 full days in the presence of SCP-3076 before being removed from the containment chamber. Even before removal, D-461923 repeatedly requested access to painting materials, and began using the foliage within the containment chamber as a pigment to paint the walls. It is worth note that SCP-3076 attempted to aid D-461923 in her work on several occasions. Upon removal, the subject was provided with an intravenous hydration and parenteral nutrition to ensure survival, then provided with the requested materials. Against administrative recommendation, D-461923 was allowed to work on the walls of Site-104 facilities, and covered 74% of the accessible surfaces on the site with murals of varying subject matter. 103 days after initial exposure, D-46193 produced a cognitohazardous piece covering one of the exterior walls of the main research complex. Viewing of the piece would cause rapid memory loss and dementia-like symptoms, though D-46193 herself was immune to the effect. The test subject was immediately terminated and all contaminated surfaces destroyed. Description: The subject was made to spend 2 full days in the presence of SCP-3076 before being removed from containment chamber. 23 hours after removal, the subject became agitated and paced around its holding pen, before using its drinking water to produce seemingly random splash patterns on the ground. The subject was provided with simple painting materials, and began teaching itself how to use them. 40 days after initial exposure, the subject was consistently producing recognizable images of elephants, and had stopped actively seeking food. A modified intravenous nutritional system was provided and testing continued. 57 days later, the subject was able to produce photo-realistic representations of its surroundings. 120 days after initial exposure, test supervisors reported unusual headaches and nosebleeds while observing the subject in the process of painting. The test subject was preemptively terminated and all accumulated works incinerated. Description: SCP-3076 was placed in a containment chamber fitted with wall-spanning mirrors. 7 days were allowed to pass. No changes in the behavior of SCP-3076 were noted, beyond some curiosity in its own reflection. SCP-3076 became restless after 6 days and feigned illness, causing the unscheduled termination of the test. Subject: A standard Foundation desktop computer. Description: The subject was placed in the same chamber as SCP-3076, provided with a dedicated power supply, and disconnected from the Foundation Intranet. A camera and evolutionary symphonic generation software were installed. The software was made to produce new music as quickly as it could, and would use direct input from test supervisors to judge the quality of the generated compositions. After 5 days, the subject ran out of RAM and the software became ineffective. Necessary modifications were made and the test continued. 23 days after initial exposure, the subject began producing variations on the same two compositions. Believing that the program had exhausted its selection of media, a flash drive of new sound elements was supplied, as well as further improvements to the hardware. The test subject continued to underperform, despite the modifications. 24 days after initial exposure, an unknown virus was found within the Site-104 computer system. While Foundation personnel attempted to remove the threat, all speakers on site were used to produce a cognitohazardous sound. Simultaneously, the malicious program hijacked onsite communications and began transmitting itself to all Foundation sites. Site-104 was quarantined and its power cut off in time to prevent catastrophic damage, though widespread injury to onsite personnel due to the sound was sustained. During reconstruction, it was discovered that SCP-3076 had made several attempts to physically tamper with the test subject. It is believed that SCP-3076 was attempting to connect the device to the Foundation Intranet during quarantine, but was unsuccessful. 1. It is hypothesized that SCP-3025 may originate from SCP-3076, though comparison of genetic material between the two objects has proven inconclusive due to biological degradation and limited sample size of SCP-3025.